WASHINGTON (Reuters) - Glenn Wright was laid off from a steel mill in Lorain, Ohio, in March, as customers for the product dried up due to overseas competition. The 60-year-old, who for decades has swung between voting Republican and Democrat, sometimes moonlights as a tax preparer for $8 an hour, but says that work is also vanishing as more firms outsource to places like India. “I don’t think things will ever be like they were,” Wright said. In that respect, Republican presidential candidate Marco Rubio agrees with him. More than any other Republican candidate, the Florida senator has made the convulsions of the modern economy the centerpiece of his presidential campaign. At a youthful 44, he sees it as his personal mission to prepare the country for a future marked by rapid technological change, the rise of the “sharing economy”, and the erosion of traditional working-class jobs due to foreign competition and automation. The stance marks him out from the rest of the crowded Republican primary field, but also comes with major risks in the many states where blue-collar workers and, increasingly, clerical employees feel threatened by the pace of change. For Rubio, who is among the frontrunners in most opinion polls, there is no going back. Rubio trumpets firms such as ride-sharing service Uber that have shaken up traditional industries. He has thrown his support behind free-trade deals such as the massive Trans-Pacific Partnership (TPP) that the Obama administration is negotiating, and vows to slash corporate tax rates to help U.S. businesses compete globally. That is fairly standard fare for Republican candidates. But Rubio has gone further. Rather than raising the minimum wage, which he said will lead to more outsourcing and automation, Rubio proposes that the government provide temporary wage subsidies to prop up low-wage workers. He seeks to reform the U.S. immigration system to allow entry based on job skills, not family ties. And he wants to transform the nation’s university system, which he has branded a “cartel,” to allow for more online learning that emphasizes tech-based skills at the expense of liberal-arts education. He proposes allowing investors and firms to “partner” with college students, paying their tuition in exchange for a percentage of their future earnings. 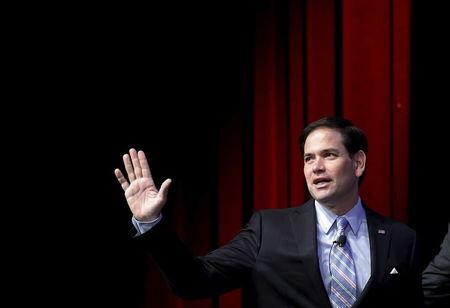 Rubio's allies say he is seeking to appeal broadly to the middle class and lower-wage workers. But while his message could connect with urban “millenials” – those born between 1980 and 2000 - the Republican primary electorate is dominated by older, rural voters who may be less willing to join Rubio’s dash to the future. LaBolt was part of President Barack Obama's re-election campaign in 2012 that used Republican nominee Mitt Romney’s success at private equity firm Bain Capital against him, painting him as a job destroyer who favored “creative destruction” over protecting workers. Of the rest of the Republican field, Jeb Bush, the former Florida governor, and Rand Paul, the Kentucky senator, have come closest to Rubio in their support for the sharing economy. But no one has positioned himself as its avatar of the new economy in the way Rubio has. Rubio’s polar opposite in the Republican field might be Mike Huckabee, the former Arkansas governor who won the Iowa caucuses in 2008, and who has been sounding populist themes in a bid to court workers displaced by the trends that Rubio has embraced. One consistent criticism of Rubio is that his outlook is too rosy, that globalization and automation will continue to hollow out the U.S. middle class, and that he hasn’t been critical enough of nations like China, which has been accused of manipulating its currency to secure an unfair advantage. “As Republicans, we tend to have a knee jerk reaction to the words ‘free trade’- that this is a good thing,” said Stephani Scruggs, a conservative activist who opposes the 12-nation TPP. Robert Scott, an economist at the left-leaning Economic Policy Institute called Rubio’s vision of the future “a pipe dream” at a time when the U.S. trade deficit is growing. The institute last year released a report that, based on the trade deficit, estimated U.S. job losses to China on a per capita state-by-state basis. Topping the list was New Hampshire - a state Rubio needs to do well in next year to stay competitive. Rubio insists that the United States can innovate its way out of its job-loss crisis — and until it does, his wage proposals and education reforms would help ease the pain. But there’s no getting around that in Rubio’s world, there will be plenty of losers. David Herring, who runs Acme Taxi in Columbus, Ohio, says his business has been cut in half by Uber. Unlike Rubio, Herring is not a fan of the sharing economy. “I hope it’s a fad that runs out soon,” he said.